A chance to discover the city of Derby, as we should arrive around lunchtime and stay for a few hours this afternoon. A highlight is the Cathedral Quarter with unique independent shops,great cafés, restaurants and bars, stunning arts and cultural venues and historic landmarks including the magnificent Cathedral itself. On to the Derbyshire Hotel for 2 nights dinner, bed & breakfast. Included visit to Haddon Hall, probably the finest example of a fortified medieval manor house in existence. 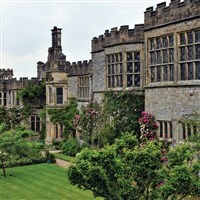 Present-day Haddon Hall dates from the 12th century and was brought back to its former glory in the 1920s, when the 9th Duke and Duchess of Rutland restored the house and gardens. Wander the gardens, grounds and countryside. Explore the interior and maybe end your visit in the café. 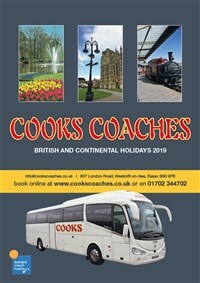 Enjoy typical Peak District scenery as well with some sightseeing time in Matlock or Bakewell. Leave after breakfast for a visit to Melbourne Hall Gardens. Located to the south of Derby the Hall is the private residence of Lord and Lady Kerr who initiated and imaginative planting scheme in the gardens, including shrubs, specimen trees and a unique collection of Magnolias and Roses, making this a garden of rare beauty. Return home later in the day. DERBYSHIRE HOTEL http://www.hithederbyshire.co.uk/. Located in the old mining village of South Normanton, right by the edge of the Peak District, the hotel is stylish and modern, with all the facilities required for an enjoyable stay. It has charm; it is cosy and thoughtfully furnished. The en suite rooms have TV, telephone, tea/coffee making. Lift. Free WiFi.